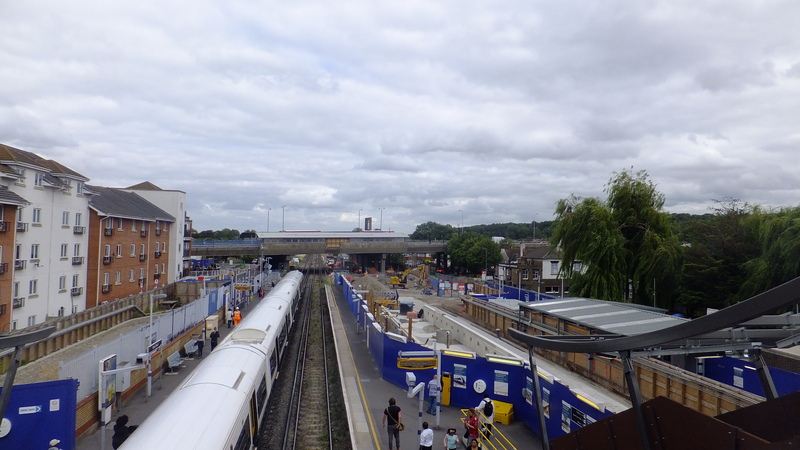 Crossrail work at Abbey Wood station is proceeding well with new platforms now visible, and the stretch down to Plumstead’s tunnel entrance reveals the large new maintenance yard taking shape. A recent comment on a new Facebook community group established in Abbey Wood got me thinking about the station, and access to parts of Abbey Wood and Plumstead, which is sandwiched between two stations. There are currently no plans for second entrance/exits at the two stations south of the Thames. Is this a missed opportunity, particularly at Abbey Wood? The western end of Abbey Wood station has sufficient space for another entrance at Mottisfont Road. There’s a large, open space beside the platform end. This area housed about a dozen council owned garages until Crossrail took over the site to use as a temporary yard. So the space would appear to be there for another entrance to be built, even with a widened rail corridor. An entrance here should be cheap to implement. No land to purchase, no buildings to demolish. One sticking point would be additional staffing costs for barriers, but it could be a part time entrance. Say, peak time only. It would greatly help the more deprived parts of Abbey Wood, and eastern areas of Plumstead, and cut up to 20 minutes walking time as the early 2000s development by Abbey Wood station is gated, forcing people around it. This aerial image shows the garages, and to the north of that a former council storage yard. It’s very likely that this entire site will become housing in coming years. Being directly beside the station it would be pretty valuable. As such, it could help fund the very modest costs of an additional entrance. The yard at the top had planning permission for housing a few years ago but the applicant took it no further and it’s likely lapsed. 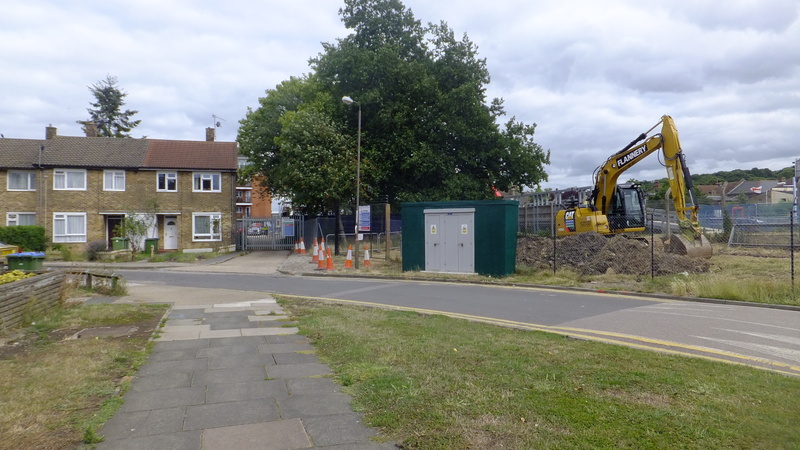 Could Greenwich council now pressure Crossrail for passive provision here for another entrance, which could proceed when the site is no longer needed as a construction base and housing plans proceed? Crossrail have made a big point about how stations are so long that each entrance will serve completely different areas in central London. This thinking could apply to suburban stations. A Plumstead resident would save some substantial walking distance and time given just how long stations are, and both Abbey Wood and Woolwich station entrances are located furthest away from Plumstead. If at the wrong end of a long Crossrail train, or even Southeastern, as there should be more 12-car trains in future, then under current plans you get off the train before a long walk to the one station exit, then double back, to head to Plumstead. At Abbey Wood it may also help slightly with diffusing passenger loads. 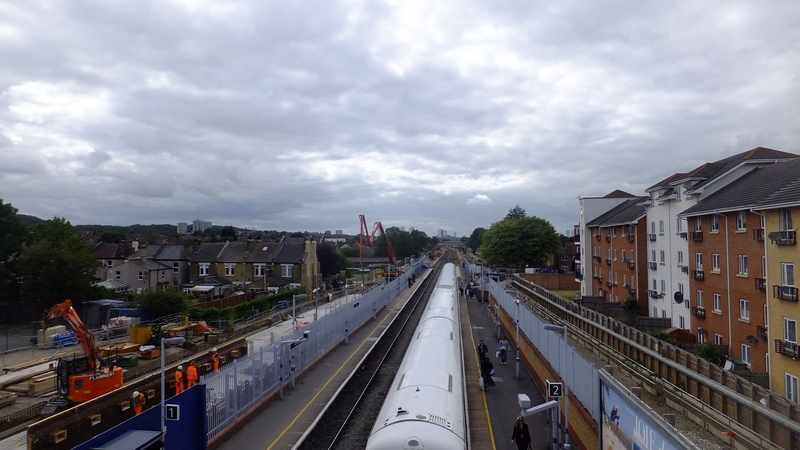 A new footbridge is due to be installed in August at the western end of Abbey Wood’s platforms. This is presumably to avoid forcing all people onto just one footbridge, saving passengers at one end of a train having a long walk to the current bridge when changing trains. Design alterations mean everyone arriving at the station from Kent (projected to be a very large number of people) will now have to go up the stairs from platform 1 and cross over to platform 3 when heading into London. Earlier plans had people alighting from a Southeastern train before transferring to Crossrail on the other side of the same platform. No longer. The same will happen when people are heading to Kent in the evening peak. Those wishing to leave at Abbey Wood will only have one exit, sharing platforms and bridges with those transferring, adding to possible passenger congestion. Another exit would help avoid that. It’s tougher to implement at Woolwich. The station is below ground, and it was an arduous struggle even getting a station approved there, let alone now altering plans for an eastern entrance. Emergency stairs are to be located at the Plumstead end of the station, and above that towers have gained approval, as seen above. If there is scope for an entrance it would surely be worth pursuing. The extra housing now proposed could help fund it. Second entrances at stations will not make a huge difference to many passengers, but it could make a real difference to some deprived areas and particularly those passengers who struggle most, such as the disabled. If it can be done cheaply and easily, as it seems at Abbey Wood, then why not? 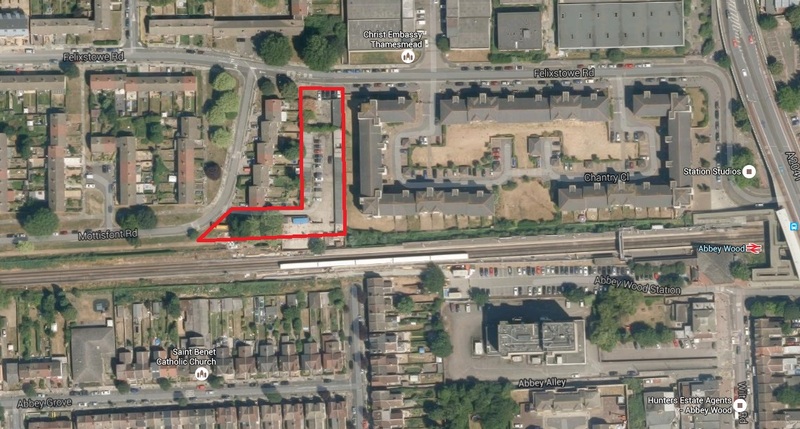 It would cut walking time for thousands of people in Abbey Wood estate and eastern Plumstead. That could change behavior away driving or taking buses, which are near capacity. The land is there, funding too with land sales and/or developers contributions, but is the will? Greenwich council did a great job in obtaining a Crossrail station at Woolwich, but they’ve hardly gone all-out in calling for the London Overground to Abbey Wood via Thamesmead. Will they push for a study into what seems an easy win to improve transport access for many people? As well as the new Abbey Wood Facebook group ‘What’s New In SE2’ mentioned above which has begun organising meetings, it is well worth looking at ‘Plumstead People’, who have been pushing for improvements in the area and have succeeded in organising meetings with local MPs and councillors. You may need to be logged into facebook for those links to work. In view of the length of Crossrail trains and the position of the existing/planned entrance, a second entrance makes perfect sense. However we have imperfect politicians in charge. The bridge at the eastern end has been planned for a while, but will have just the one span from the Crossrail platform to the Southeastern (future London Overground) platform. I’ve been arguing for the local authorities to lobby for provision to provide another span (as the recently installed bridge currently has) in the future, from the Crossrail platform to the council owned land off Mottisfont and Felixstowe Roads, which will very likely become housing. Housing development could fund the additional entrance at that spot. But local cllrs like the council leader seem disinterested in even asking for provision, let alone pushing for it in coming years, despite the boost it would give to deprived areas and cutting off a long walk, particularly helping the elderly and parents. I saw Mathew Morrow a labour councilor for plumstead & he seemed pretty resigned to the fact there will be the one entrance for the Elizabeth line at woolwich provided for the gentry who live in the posh armory flats. You mention there might be a fire exit provided at the eastern end, do you think we,ll be able to use it regularly I.e. It won’t be lock at the top like the one at canning town where you change from dlr to jubilee line ?